Submitted by Zebra Mussel on Thu, 03/01/2007 - 22:41. A single Certified Emissions Reduction (CER) amounts to one tonne of CO2 equivalent. Kyoto is acting as a big ol driver for green projects. You see mid last year a CER / carbon credit (like those generated from a bird grinding wind turbines) were trading for over 30 euros per metric ton. Now there WAS a crash last year (from 30 to 13 euros per CER in just a few days) but markets have since been on the uptick. I just did some rough numbers in support of a feasability assessment for a methane to energy project in Khazakastan. My role was to get the teams arms around the value of the CER's. At a very conservative price we could sell the carbon credits for an equal amount to what our client will get for plugging the methane into a pipeline or converting it to energy. (ie this is big bucks folks). Yes, the market is volitile. In the EU the prime market is the ETS or European Trading Scheme. As the USA is a pile of compost in respect to our stance in greenhouse gas reductions we can only generate / sell carbon credits to voluntary markets... like that of the Chicago Climate Exchange. Needless to say, big boi multinationals who's shareholders recognize the polar ice caps are melting are buying, selling, and trading carbon credits on the 'voluntary' markets with a ferver. Buyer beware. There are good things happening, but HIGH dollar returns on investments in voluntary markets have lead to a WILD WEST sort of mentality. Good folks and good things are happening, but there are scams O plenty, and one does not want to drop coin on shoddy carbon credits and be left out in the cold... especially when its getting hot. ;-) (pun intended, global warming, get it). Any wind turbine projects in Ohio WOULD be able to generate carbon credits that, if certified could be traded on the voluntary market. That being said, just like our potential project in Khazakastan, if wind turbine projects in Ohio can stand on their own feet financially regarding ROI (return on investment), any revenue from credits would be icing on the cake. And better if not factored in to any formal ROI because of the volitility in the international markets for carbon credits. FYI the project in KZ is a coal mine methane project. Currently our friend there operates coal mines and vents methane to the atmosphere to keep miners alive. Coal seams exude methane, if you dont vent people die and things blow up. Given the availability of technology (via our joint venture) they are investigating recovering coal mine methane (cmm) and converting it to energy, heat, or putting it into a pipeline for sale. Just to calibrate you, methane is 21 times more powerful of a greenhouse gas insulator compaired to carbon dioxide. As such, methane recovery projects have a multiplier effect regarding carbon credits. For each ton of methane certified as diverted from the atmosphere, one has the potential to be presented with 21 CERs or 21 carbon tons worth of diversion on the European Trading Scheme (ETS). So for each metric ton of methane recovered, they are saving the equaviallent of 21 tons of carbon, and 21 times the carbon credits... again in theory and in a volitle global carbon market. In actuality my last quote from the Chicago Climate Exchange said we should use (ie they would buy at) a multiplier of 11. Freeking voluntary markets! Of course KZ is only a signatory of Kyoto, they have not ratified the treaty (which expires in a handfull of years anyway). Ok enough schooling...with out further adue, enjoy the latest United Nations Environmental Program (UNEP) graphic on how the world is marching towards hitting (or not) their carbon targets under Kyoto. Target reached in 2002, but the emissions are increasing again. By the end of 2005, countries that are obliged to reduce their greenhouse gas emissions shall report on their progress towards reaching the emission targets set in the Protocol. Even if the total emissions from Annex 1 countries decreased by 6,4 % between 1990 and 2002, only a few of these countries can report on a real progress in reaching their emission targets. The decrease is mainly caused by a decrease in emissions, particularly by the Eastern European states and Russia due to economic downturn. The decrease in these countries have been 40 %, while the other Annex 1 countries have increased their emissions by 8,4 %. 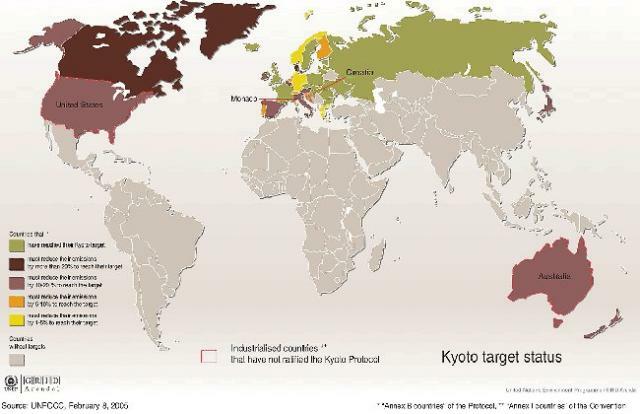 Kyoto protocol, 2002 target status. (2005). In UNEP/GRID-Arendal Maps and Graphics Library. Retrieved 02:34, March 2, 2007 from http://maps.grida.no/go/graphic/kyoto_protocol_2002_target_status.